Casey and I celebrated a belated Valentine’s tonight with an unbelievable dinner out at the City Hall Steakhouse here in Scottsdale…. imagine Ruth’s Chris on disco. I think I ate a pound of butter, no joke, between the mashed potatoes smothered with chunks of lobster in beurre blanc, the butter crusted filet mignon, and the fourless chocolate cake. Sin on a plate. But a night out without frantically catching pieces of bread being flung from the highchair of a future major-leaguer was the best part. Casey and I celebrated a belated Valentine’s tonight with an unbelievable dinner out at the City Hall Steakhouse here in Scottsdale…. imagine Ruth’s Chris on disco. I think I ate a pound of butter, no joke, between the mashed potatoes smothered with chunks of lobster in beurre blanc, the butter crusted filet mignon, and the fourless chocolate cake. Sin on a plate. But a night out without frantically catching pieces of bread being flung from the highchair of a future major-leaguer was the best part.And Kenny was in fine hands. My in-laws are out here for a week, and they graciously stayed home to eat leftovers and watch late night TV so that Casey and I could go out and gaze at each other across a table for two without having to sing “The Farmer and the Dell” to occupy The Wiggler until dinner arrived. We even lingered over coffee and dessert. And drove the convertible. And I wore white, without fear of toddler smears and spatters. A wonderful night, no doubt about it. And we managed to only talk about Kenny half the time, too. Kenny has been happy as ever to have not only me to play with him all day, but his “PAPA!” and “MaMA Woobee” (that is, Gramma Ruby) here to dote on his every antic. 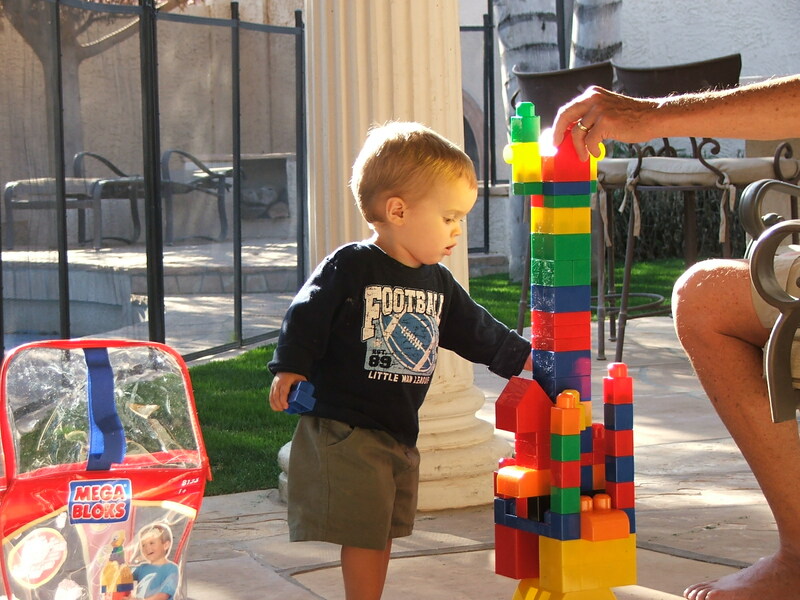 His Papa is almost as serious about lego buildings as he is. Stay tuned: tomorrow they build the Sears Tower.